Members of the Randolph team deliberate their answer to a question at the Ethics Bowl. Randolph College won two debates in the Virginia Foundation for Independent Colleges (VFIC) 17th annual statewide collegiate Wells Fargo Ethics Bowl last weekend. The event was held in Roanoke at Hollins University. 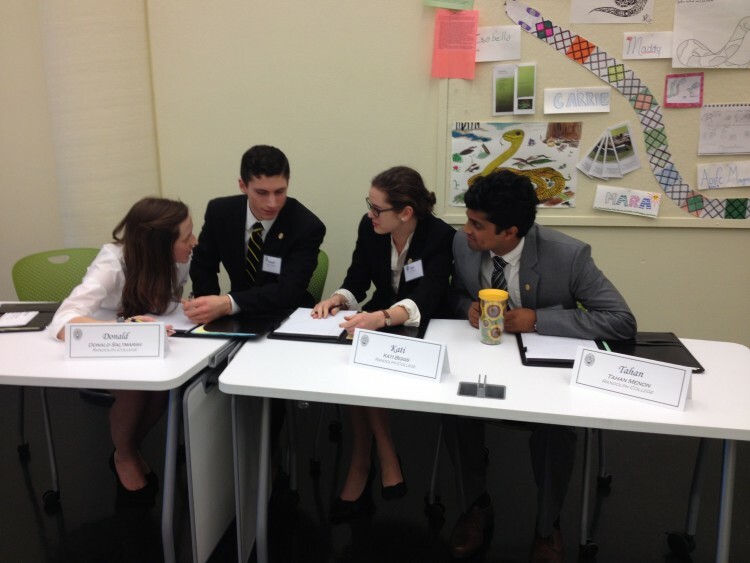 Discussing a variety of case studies highlighting ethical dilemmas, Randolph won matchups against Emory & Henry College and Hollins University, and the team lost by narrow scoring margins to Mary Baldwin College and Hampden-Sydney College. Members of the team included Grace Cummins ’16, Donald Saltmarsh-Lubin ’16, Tahan Menon ’16, Kati Biggs ’18, Igor Ngabo Rwaka ’18, and Jordann Pruitt ’19. The faculty coordinators were philosophy professor Kaija Mortensen and physics and environmental studies professor Sarah Sojka. Mortensen praised the team members for their oratory skills and the strong arguments they made during each round of competition. 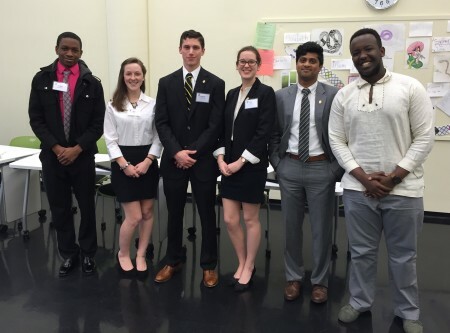 Members of the 2016 Randolph College Ethics Bowl team included: from left) Jordann Pruitt ’19, Grace Cummins ’16, Donald Saltmarsh-Lubin ’16, Kati Biggs ’18, Tahan Menon ’16, and Igor Ngabo Rwaka ’18. Pruitt and Rwaka traveled with the team as alternates, which Sojka said should help prepare them to compete in next year’s Ethics Bowl. “Kaija and I were both very proud of our team and their ability to compassionately and clearly articulate solutions to difficult ethical problems,” Sojka said.